According to the size of your pet, you can choose a more suitable and safer way to manicure for your pet. Allows you to manicure your pet's nails, high hardness, grinding power extraordinary performance, durable, so you have a fine experience. Have more lasting use, give you 180 minutes long battery life experience. Use your precious free time more effectively. So you no longer have to be subject to restrictions on the venue. To create a more comfortable environment for you and love, liberate your ears. Give your lovely pet a more high-quality gift. 3 GRINDING MODES - There Are 3 Different Ports For The Dog Nail Grinder,Matching All The Size Of Pets.You Can Simply Rotate The Grinder,Choose a Perfect Size For Your Pets. ULTRA QUIET MOTOR - There Is a Ultra-Precise Nail Grinding In The Dog Nail Grinder,Low Vibration,Ultra Low Voice,Reducing Pet's Anxiety.Your Beloved dogs and cats Won't Be Painful And Scared Anymore,Stress-Free Grooming. SMART USB RECHARGEABLE DESIGN - The Dog Nail Grinder Is Available For All The Standard Phone Power Adapter,Power Bank,Laptop,Or Usb Outlet. The Dog Nail Grinder Could Lasts For 5-Hours Using After a 2-Hours Charge.There Is a Device Inside That Could Protect Against Overcharging. SILICON CARBIDE GRINDER HEAD - The Dog Nail Grinder's Grinder Head Is Made Of Silicon Carbide,With Great Hardness And Super Durable Material.More Importantly,It Could Last For Lifetime Use.Worth Trying! LIFETIME WARRANTY - Our Dog Nail Grinder Provides One-On-One Email Advice To All Customers. 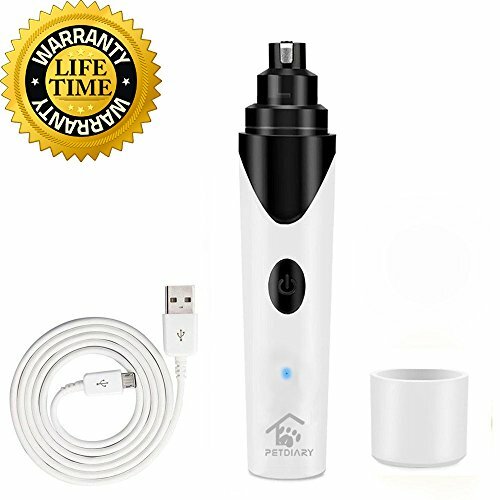 If You Ever Have Any Issue With Your Dog Nail Grinder In PETDIARY, Manufacturer Will Provide a Full Replacement Or Refund For Your Pet Nail Grinder. Risk-Free Purchase. If you have any questions about this product by PETDIARY, contact us by completing and submitting the form below. If you are looking for a specif part number, please include it with your message.